National Geographic aired “Journey to an Alien Moon” as part of its “Explorer” series last night. It describes how the first proof of Europa being an icy moon was obtained from Galileo spacecraft, how life was found to exist in various extreme environments on earth, and how ENDURANCE could be a precursor to smaller under-water robots that could be sent to Europa in search of life-forms. There is footage from our tests in the Neutral Buoyancy Lab and from our 2008 Antarctica expedition. All team members make an appearance and Bill Stone is extensively interviewed. 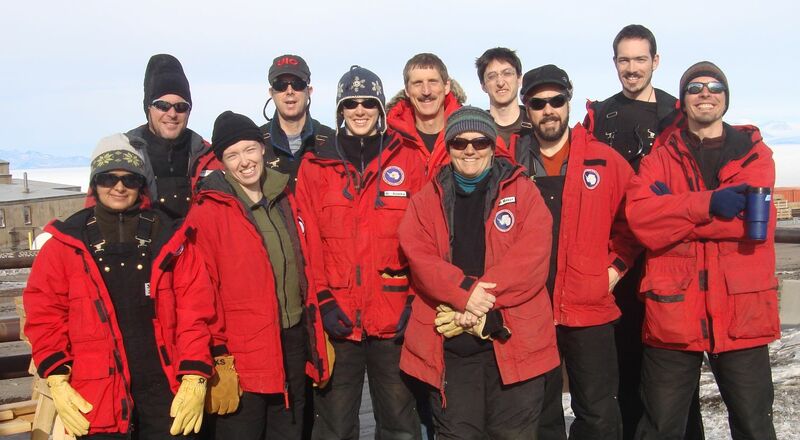 ENDURANCE team in Antarctica in 2008. From left to right - Back row: Bob, Peter, Bill, Chris, Kristof; front row: Shilpa, Vickie, Annika, Robin, Bart, Maciej. Thank you all for your interest in this blog. Our 2008 expedition is complete and I take this opportunity to summarize the achievements for ENDURANCE. We will be writing papers on various aspects of the project and I will post the appropriate links here. The ENDURANCE project is funded by NASA’s ASTEP (Astrobiology Science and Technology for Exploring Planets) program. The objective of this program is to develop and utilize science and technology that will enable exploration and discovery of life forms on other planets and satellites. To develop and validate the technology, field testing is performed in extreme environments on the earth. Examples of such extreme environments on earth are the Antarctic Dry Valleys. Taylor Valley, where we performed our experiments is one of these dry valleys. The achievements of this project for Nov-Dec 2008 can be divided into two categories. We demonstrated that current technology can be deployed to explore under-ice lakes on earth for life-forms. The under-water robot developed by Stone Aerospace measured the biogeochemical properties of water with an instrument package (profiler) all the way from the lake ice to the lake bottom. The profiler camera took pictures of the lake bottom that showed microbial mats, and hence confirmed the existence of life forms that have been found to exist through previous research. Our vehicle was able to reach within 1 to 2 meters of a specified target and came back to within 2 to 3 meters of the melt-hole after travelling as much as 1700 meters. We developed a visual homing algorithm that consisted of (1) Finding a blinking light by moving in a spiral pattern and identifying it as a target to home to (2) A control algorithm to home to the identified target. This algorithm worked very well and allowed the robot to distinguish the target light source from other ambient light sources, to stay centered on the light source, and to rise through a melt-hole with tight clearances. We also demonstrated the ability to collect biogeochemical data along the entire depth of the lake and at any specified location in the lake. We demonstrated the ability to profile the lake bottom and glacier face using the data collected by the on-board sonar sensors. The navigation, homing and data-gathering capabilities make the vehicle a unique and useful tool for scientific exploration of under-ice lake environments. Using the profiler, we measured the biogeochemical properties at 70 grid points in West Lake Bonney. We also gathered sonar data for mapping Taylor Glacier face and the lake bottom. This data will be analyzed by Peter Doran and John Priscu to confirm their hypotheses about the physical and biogeochemical structure of Lake Bonney and for building a 3D map of Taylor Glacier and subsurface of Lake Bonney. Andrew Johnson’s lab will be developing the visualizations for the data. The birds flying in the sky and bird sounds. Flight delays due to bad weather are common. The SAFAIR L-100 that we were supposed to fly in has not left Christchurch yet due to bad weather. It is expected to leave Christchurch at 12:00 p.m. This means that it will get here around 8:00 p.m. So we might leave early next morning. If the L-100 does not arrive, a smaller plane will leave with some of the people. Some people have been put on the bump list, including Chris and Kristof. This means that if the smaller plane flies, they will not get a seat. Update: The L-100 has been cancelled. The smaller plane, Hercules, is expected to leave tomorrow morning. This means that Chris and Kristof will get bumped off, and will probably fly out on the next flight on Friday. Chris, Kristof and I fly out to Christchurch tomorrow. We returned our sleep kits and other gear to BFC and have to drop off our bags tonight. Bill and Vickie will fly out on Jan 2. We reached McMurdo at around 10:30 p.m. on the 26th (Friday). We had worked very long hours for the past 4 weeks and everyone was exhausted. It was strange to suddenly see so many people and great to have access to things that we usually take for granted in our industrialized world – running hot water, hot shower, clean clothes, fresh vegetables and fruits. We took Saturday off and I managed to sleep for 12 hours straight on Saturday night. We sorted through our lab stuff on Sunday to decide what stays here for next year’s mission and what goes back with us to Stone Aerospace. Based on the data from previous missions and what we saw yesterday, we identified a section of the glacier face that was reasonably flat, and the water near it was deep enough for the robot to approach it safely. We decided to drive up close to this part of the face, and try to get some images. The robot managed to follow the wall closely at a distance of about 2.5 m and we got some images of the glacier face. The visibility was poor and the images were not very crisp, but we were still able to see the glacier face. Image of the glacier face taken during our wall-following mission. Thanks to Kristof for this image. We are done with our missions today – we got all the data we wanted and we will start packing up tomorrow. We celebrated our success with champagne and raised a toast to everyone who had contributed to this project. This list is very long and I have mentioned some of the people in my previous blog entries, but I will try to make a more comprehensive list later. We performed two more glacier missions in the past two days and have explored most of the glacier face. Bill and I had been working on extracting and plotting the Delta T data from the past few days to see how the glacier looks like. The data from each mission consists of approximately 25 million (x,y,z) points that correspond to the sonar returns. Bill plotted up the points in 2D, and we used this to plan today’s glacier mission so that we would cover parts of the glacier face we had missed in the previous missions. 2D model of the glacier face from the Delta T data. The points represent the Delta T range returns. The grey line was our approximation of the glacier face. Thanks to Bill for the plot. Today’s mission consisted of scanning the entire glacier face with the Delta T – we had the robot facing the glacier wall at all times while moving sideways. This was a relaxed mission for us since we ran the entire mission as an automated script and all we had to do was sit back and watch the data and the visualizers. Bill plotted the data from all the missions to get an amazing view of the glacier face and lake bottom near the glacier. 2D model of the glacier face. The data from today's mission was added to the previous model. This shows that we obtained coverage of the areas that we had previously missed. A plot of the Delta T data showing the lake bottom, lake ice and glacier face. The lake ice is seen on the top in dark blue while the green points at the bottom show the lake bottom. The glacier face does not come all the way to the bottom at all places but floats. We also took a picture of lake bottom with our profiler camera. Picture of the lake bottom in a shallow region near the glacier taken by the profiler camera. It appears that this is the interface between sand and ice. You are currently browsing the archives for the ENDURANCE 2008 category.